I'm living through this magical phase right now. I'm always busy doing something and I'm nearly always thrilled about where I am. Life is shiny. For instance, Saturday I rushed home to take a quick half hour to change clothes and eat before heading downtown for Ballet Arizona and the Desert Botanical Garden's presentation of Opus Cactus. Though 7:30 suddenly felt like much later in the evening than it perhaps should, I felt like I was sitting in a dream there in the theatre, like I was drifting through an ethereal ending to an awesome day (part of what made the day awesome was that I pet a beautiful alligator, but that's another story). 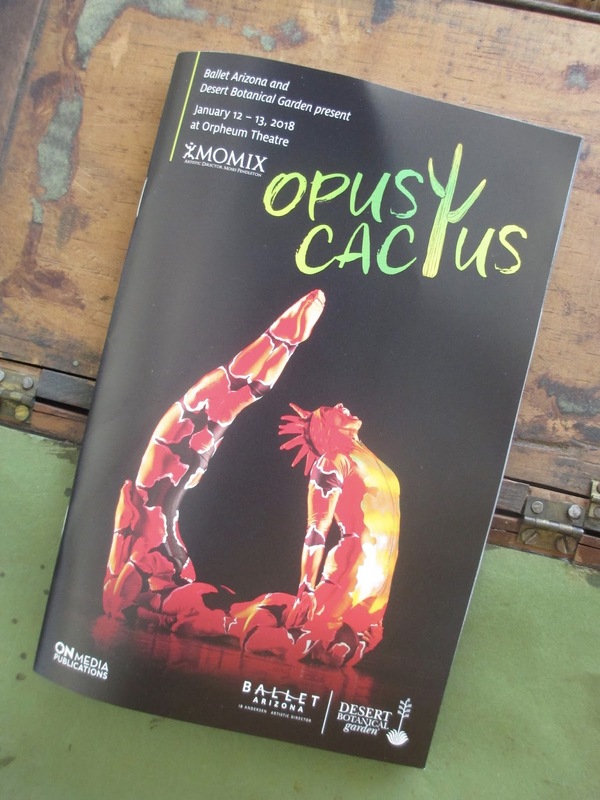 So what was this Opus Cactus? Initially I thought it would be one of the performances to skip (I don't, after all, aim to see every production from Ballet Arizona). Then I allowed a second glance and realized that it's a show inspired by the desert and that's exactly the type of thing I say I love and want to support. Though the show was presented by Ballet Arizona, the performance was put on by MOMIX, which is a touring company under the direction of Moses Pendleton. So it wasn't exactly ballet; the style was more modern, I would say, but not exactly "modern." More like dance with a twist of Cirque du Soleil, actually. There were a series of scenes that played out essentially as separate tableaus, each one representing something about the desert. We started with Desert Storm, where tumbleweeds bounced about the stage. We saw saguaros and snakes and lizards and representations of the sun. So everything had a poetic quality to it that formed a celebration of not just the Southwest but also other deserts in the world. The music, likewise, began with Southwest inspiration and moved on, in later scenes, to include other music from around the world. Such sounds also combined the traditional and the modern. Let me get back to that Cirque du Soleil reference. The MOMIX dancers are amazing. Such strength and agility and ease of movement. They were literally forming the shapes of the desert with their bodies. Often a scene would start with just silhouettes; the lighting might later increase so that you could then see the people in costumes, or sometimes the light stayed dim enough that all you saw were silhouettes. Either way, the visual scene was carefully controlled. When you're watching in awe of what bodies can do and how they can move and work together, the general feel of a dance tends to be sensual. But somehow this all felt like such high art that that it wasn't sensual at all: you became aware of, for instance, how one person was holding up another to form a shape and yet the effect was simply awe at the shape rather than focus on the two people. If that distinction makes sense. The point is, yes, it enhances the experience to realize how the dancers, as people, are moving. But the images that they are creating are the most important thing that you see on the stage--and they're images of plants and animals, desert imagery, not imagery of people. Some scenes I liked more than others. And sometimes I wished that instead of seeing separate tableaus (the show was short compared with what I'm used to at only about an hour and a half), we were seeing more of a complete and connected piece. But overall it was such an amazing performance and visual image that it turned out to be one of my favorite shows from the past year. And what made the evening more magical was the fact that it was not in the usual Symphony Hall but rather down the street at the Orpheum Theatre. This was my first time at this theatre, and I do admit that I found the inside layout a bit confusing at first (I like to always know where exactly I'm going, so it throw me off when I enter a new place where the layout isn't immediately clear). It's a much smaller location than Symphony Hall and has a completely different style. This theatre, outside and then both in the halls and in the theatre itself, is beautiful. The peacock ceiling above the farther staircase and the art nouveau (at least, that's the style it looked like to me) wardrobe and oil paintings upstairs and the chairs in the downstairs bathroom and the dusky, starry sky in the theatre. So many details all around to look at and take in; I can see why there are tours of the theatre during the day. Maybe because of the setting, I almost felt like people were more dressed up here than they are for the ballet or opera at Symphony Hall. Even if that difference was just my imagination, I felt at home in the beauty of it all. Petting an alligator at work and then dressing up in green sequins to watch dancers imitating the movement of a gila monster. What a day, eh?